148 pages | 78 B/W Illus. In Japan, the main local administrative affairs are traditionally allotted to prefectures and municipalities, while communal disposal systems, fire-fighting and regional development takes secondary importance. However, two new changes to the frame of local governments have altered the main frameworks of national and provincial governance. With decentralization reforms taking effect, more local bodies are gaining autonomy and departing from uniformity. This has allowed methods of cooperation between governing bodies to diversify– trends which augur a dissolution of uniformity in Japanese local administration. If left alone, it may eventually lead to disparities between principal and peripheral bodies, and thus complicate the administrative systems further. How will these changes affect future community development? This book aims to address the dynamism of concepts of wide area public service in Japan. It advocates the use of flexible strategies to ensure service standards are best suited to each regional demand. This concept can be called “departure from uniformity”. This book also examines the advantages and disadvantages of these shifts for the future of Japanese public policy, and suggests various strategies to prevent further complications; e.g. autonomous settlement zone. 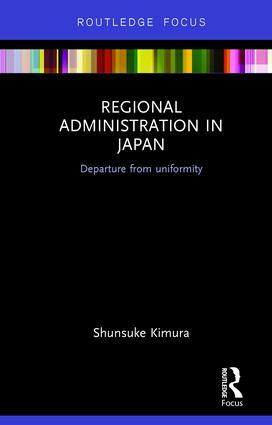 Regional Administration in Japan: Departure from uniformity will interest researchers of Japanese public policy and public administration. This book will also engage researchers of Japanese politics and Japanese studies in general. Shunsuke Kimura is Professor at the Graduate School of Law in Hitotsubashi University, Japan.